A fundamental design flaw in Intel's processor chips has forced a significant redesign of the Linux and Windows kernels to defang the chip-level security bug. Programmers are scrambling to overhaul the open-source Linux kernel's virtual memory system. Meanwhile, Microsoft is expected to publicly introduce the necessary changes to its Windows operating system in an upcoming Patch Tuesday: these changes were seeded to beta testers running fast-ring Windows Insider builds in November and December. Crucially, these updates to both Linux and Windows will incur a performance hit on Intel products. The effects are still being benchmarked, however we're looking at a ballpark figure of five to 30 per cent slow down, depending on the task and the processor model. More recent Intel chips have features – such as PCID – to reduce the performance hit. Your mileage may vary. Bugs in modern computers leak passwords and sensitive data. Wondering!! Since Norton service are on MS Azure maybe this could be the crux of some of the cloud issues Core is experiencing. The tool posted by @NICK ADSL UK is about a different, older vulnerability. A tool should be available soon to check for this vulnerability. Available now as a beta. Microsoft is aware of a new publicly disclosed class of vulnerabilities referred to as “speculative execution side-channel attacks” that affects many modern processors and operating systems including Intel, AMD, and ARM. Note: this issue will affect other systems such as Android, Chrome, iOS, MacOS, so we advise customers to seek out guidance from those vendors. Microsoft has not received any information to indicate that these vulnerabilities have been used to attack customers at this time. Microsoft continues to work closely with industry partners including chip makers, hardware OEMs, and app vendors to protect customers. To get all available protections, hardware/firmware and software updates are required. This includes microcode from device OEMs and in some cases updates to AV software as well. The following sections will help you identify and mitigate client environments affected by the vulnerabilities identified in Microsoft Security Advisory ADV180002. 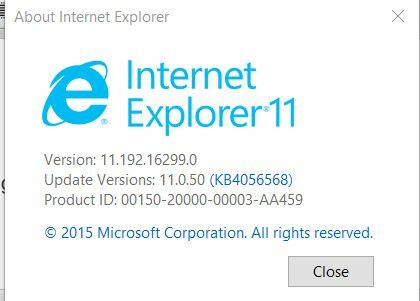 The Windows updates will also provide Internet Explorer and Edge mitigations. We will also continue to improve these mitigations against this class of vulnerabilities. Does anyone now whether the Norton systems protects a computer against hackers using the weakness found in Intel technology? My two machines running Windows Defender have received this update but the machine running Norton Security has not. Microsoft has released updates for Windows Operating Systems. There's a thread here with more information. Yes, also want to know if Norton products set this key! Anyone checked already? In the article on https://www.theverge.com/2018/1/4/16848976/how-to-protect-windows-pc-mel... there is a mention of Security researchers are attempting to compile a list of anti-virus software that’s supported, but it’s a bit of mess to say the least.That list can be found here: https://docs.google.com/spreadsheets/d/184wcDt9I9TUNFFbsAVLpzAtckQxYiuir.... It states that Symantec	Endpoint Protection	N	N	Currently causes BSOD patch today	https://pbs.twimg.com/media/DSsRaXBVoAEDpMR.jpg:large First N=Sets Registry Key; second N=Supported. Is this the same engine used in Norton products? Krusty13: A tool should be available soon to check for this vulnerability. Your system either does not have the appropriate patch, or it may not support the information class required. Maybe you should try, for W 10, to manually update KB's 4056892 and 4058702 and see what happens with Norton. You should not have any issues. "Microsoft has warned users that its patches for the dangerous Meltdown CPU bug won't reach them if their third-party antivirus hasn't been updated to support this week's Windows security update. " Is there any concrete news from Symantec on the compatibility of Norton Security ? It was posted today http://www.zdnet.com/article/windows-meltdown-spectre-patches-if-you-hav... that Microsoft released a patch yesterday for this however if your AV software has not been updated you would not receive the update until they do. I would have assumed that Norton would have been on top of this as I ran live update before I checked for the Microsoft update. Any word on when Norton will have their fix in place? All: I have validated this registry key IS indeed set on my machine: Key="HKEY_LOCAL_MACHINE"Subkey="SOFTWARE\Microsoft\Windows\CurrentVersion\QualityCompat"
Therefore it appears Norton has done what was required for the patch to be installed. Installing the patch now. There are 2 patches for W 10 which can be downloaded from Microsoft Catalogue KB's 4056892 and 4058702. KB 4058702 is about 13 MB. All my machines have now updated. There's an article here describing how you can check if your Windows 10 machine is still vulnerable. Chip hacks: How much is your device at risk? Security flaws leave millions of computers at risk, but how much should you worry? Technology reporter Jane Wakefield has dissected the story for us. As technology companies race to fix two major vulnerabilities found in computer chips, the ways in which those chips could theoretically be targeted by hackers are becoming clear. Collectively, Meltdown and Spectre affect billions of systems around the world - from desktop PCs to smartphones. So why are so many different devices vulnerable - and what is being done to fix things? I am out of my comfort zone and am not sure what this all means. My reading is that there is something I can download from Microsoft that limits the problem with Intel. Is that right? Take a breath and read this. I got the MS KB installed this morning with no problems. Norton Security w/BU is 28.11.2.7 Windows 10 Pro 32 bit. I did just read this and the "won't get" referred to seems only to be for certain earlier versions of Windows? BUT… you won’t get any patches installed unless and until your antivirus software sets a specific registry key. In a default installation of Windows 7, Windows Server 2008 R2, and Windows Server 2012 customers will not have an anti-virus application installed by default. In these situations, Microsoft recommends installing a supported anti-virus application such as Microsoft Security Essentials or a third-party anti-virus application. Hugh, the KB I linked for Win10 1709 also has that caveat. OK I was replying to Permalink in a very long thread. Which was the W10 1709 message? Thanks to everyone that posted to this tread. It was kind of weird as I ran Live Update this morning before I ran a Windows Check For Updates and Windows said that I didn't need anything. This afternoon I checked the registry entry that was posted and sure enough the entry was there as described so I ran Windows Update again on my system and this time I got the download and got it applied without any issues. I don't know whether Norton made another update to my system after the manual Live Update I ran earlier or whether Microsoft simply wasn't read to send out the update at the time I checked this morning. Either way I'm good. Can anyone confirm if it is possible to download the patch on Windows 7 machine? I have a theory that if you have a W10 machine and have Defender enabled to do a scan once in a while, that the registry key-setting is coming from Defender, not Norton? Downloaded the x5-Windows Server 2008 Updates. x1-IE9 Windows Server 2008 Updates. 1. Run LiveUpdate, until clear. 2. Create a Windows Restore Point. (WU, isn't going to do it for you). 3. Run the 'msu' files in turn. Restart your machine, when all 6 have installed. 4. My pc, installed closed & opened in the prescribed manner. 5. Reservedly, All is well. All 'legacy stuff'. Wonder if it'll ever turn-up ? On Microsoft support is article "Windows Client Guidance for IT Pros to protect against speculative execution side-channel vulnerabilities"
"Customers must take the following actions to help protect against the vulnerabilities. Apply the applicable firmware update that is provided by the device manufacturer. Windows-based machines (physical or virtual) should install the Microsoft security updates that were released on January 3, 2018." I did not receive any Microsoft security updates released on January 3 ! I have Norton ? Internet Security installed on my laptop with Windows 8.1. How can I get these security updates ? That is testing for an older vulnerability, not this one. ...I did not receive any Microsoft security updates released on January 3 ! I have Norton ? Internet Security installed on my laptop with Windows 8.1. How can I get these security updates ? Win8.1 and Server 2012 R2 KB 4056898 is the January security-only patch, which must be manually downloaded and installed. It, too, contains only the Meltdown fix. (There was no Preview Monthly Rollup in December.) I don’t see any references to a Win8.1 Monthly Rollup — it’s likely we’ll see one sooner or later. The How to Get This Update section of the Microsoft KB article January 3, 2018—KB4056898 (Security-only update) notes that the Win 8.1 KB4056898 update can be manually installed using the appropriate standalone .msu installer posted <here> on the Microsoft Update Catalog - just save the correct 32-bit (x86) or 64-bit (x64) .msu installer for Win 8.1 to your Windows desktop, close your browser, and double-click the file to start the installation. You can also wait a few days for the January 2018 Patch Tuesday updates this coming Tuesday (09-Jan-2018) and a patch will likely be delivered via Windows Update by that time. I've had the MS update on both my machines. I would imagine that the manufacturer's update would be directed to any INTEL chip on the motherboard. I would anticipate that the CPU itself cannot be modified? I'm using an ASUS/AMD motherboard dating back to the release of Windows 7 although I'm on Windows 10 now. The ASUS website does not show anything relevant and indeed officially mine may not support Windows 10! I find Speccy invaluable in situations like this since in a few seconds it lists more technical information about your system than you could possible want to know! But in a format very easy to follow and with the bonus that you can Copy/Paste a word or bits of it so that if I can't remember the exact definition of my Motherboard, one click and I not only know it's M4A78T-E but I can paste that into Google or the ASUS website if I need to look for something related to it. Just in case it is useful for anyone. Dell has a site where firmware/BIOS releases will be once they become available. Hello, can someone tell me how to check to see if my Reg Key has the required update to install the latest Win10 1709 update? I want to know if Norton has updated this key so Windows 10 Update will not cause a BSOD when updated. I did get the Windows update and it's pending installation. From what I understand from above, I wouldn't have received the update unless Reg Key had been updated? I just want to confirm on my laptop it has required Reg Key before proceeding. I tried to locate an official announcement from Symantec that Norton Security is compatible with Windows Update KB4056892. Two of my computers running Windows 10 and Norton Security have been updated but with KB4056892 but one, running Windows 8.1 and NS, has yet to be. Does anyone know if there are any compatibility issues with Norton Security on Windows 8.1 and Windows Update KB4056892?